Occlusal radiographs are made using an extreme bisecting angle technique. 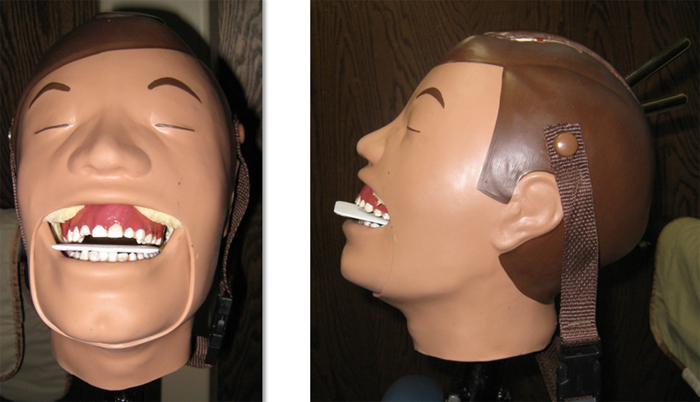 The film/sensor is placed on the occlusal surfaces of the teeth. 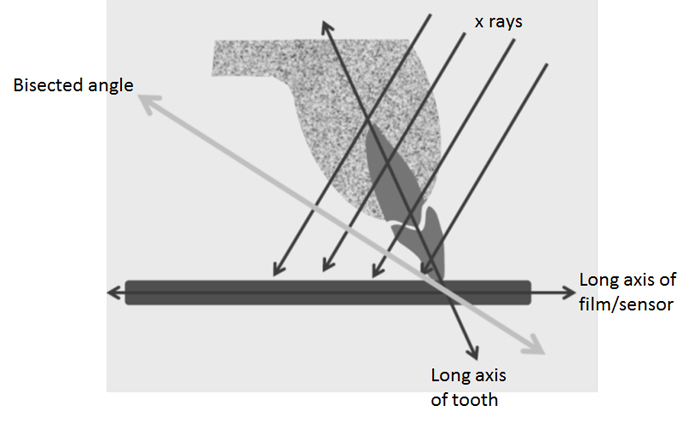 Using the long axis of the tooth and the long axis of the film/sensor an angle is created between the two. To determine the direction of the x ray beam, the angle must be bisected first and then orient the x ray beam perpendicular (at 90 degrees) to the bisected angle. 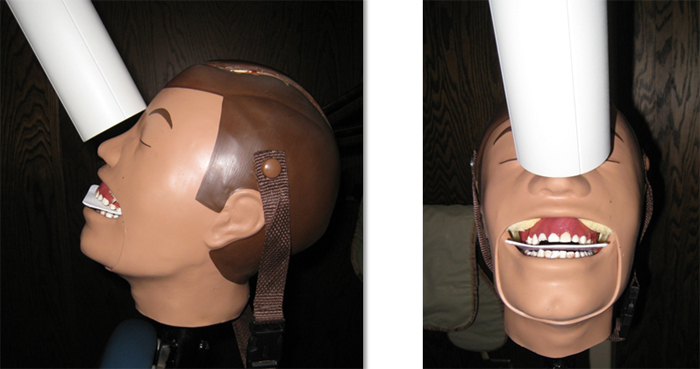 This technique results in more distortion and shortening of the teeth. All occlusal radiographs are made using a round PID. 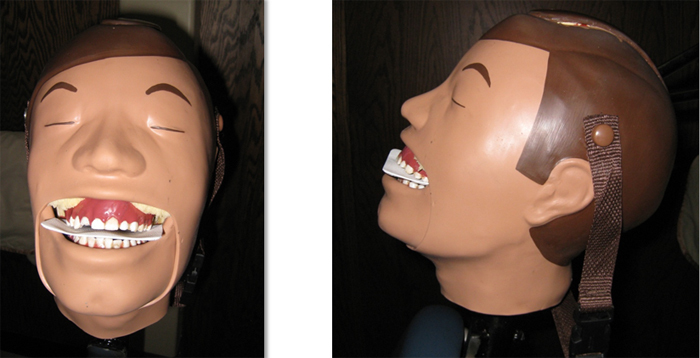 The maxillary anterior occlusal radiograph can be made on both adults and children. 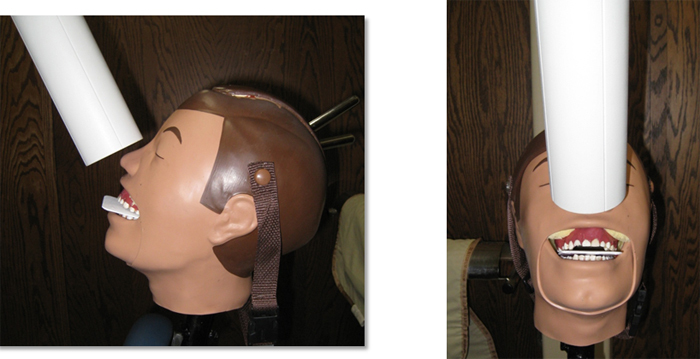 For an adult, it is made using a size 4 film/phosphor plate with the long axis antero-posteriorly or horizontally. 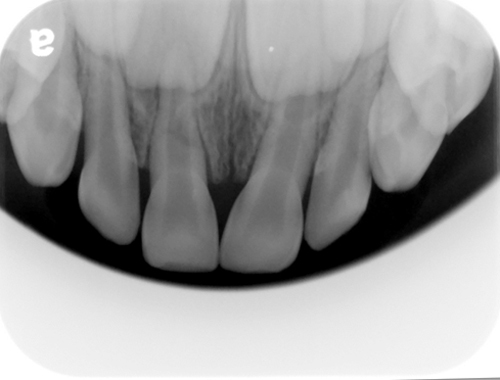 It is important to have a minimum of 1 cm of film/phosphor plate anterior to the maxillary central incisors. The central ray (PID) is aimed with a vertical angle of +45 to +60 degrees, a horizontal angle of 0 degrees and centered through the tip of the nose. For a child, a size 2 film/phosphor plate is used with the long axis lateral. The central ray is positioned the same as for an adult. 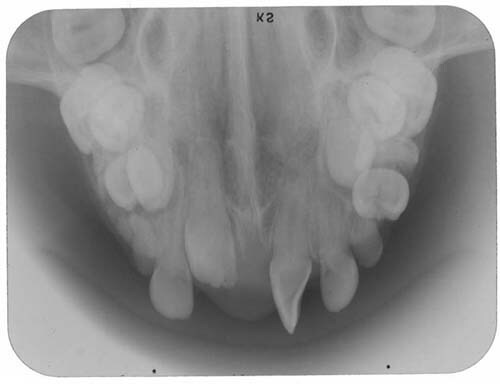 Long-axis of film placed antero-posteriorly with a minimum of 1 cm of film anterior to central incisors. PID positioned (centered on tip of nose) with a vertical angle of +45 to +60 degrees and a horizontal angle of 0 degrees. 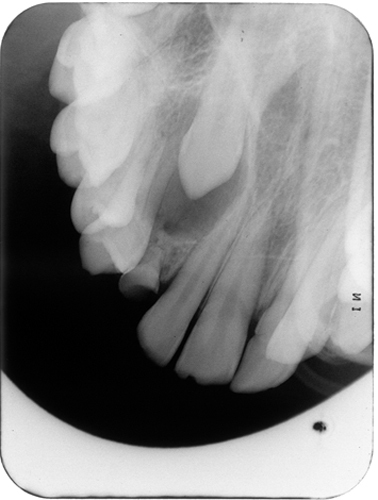 Example adult maxillary anterior occlusal radiograph. Example child maxillary anterior occlusal radiograph. The maxillary standard occlusal radiograph is made with a size 4 film/phosphor plate. The film/phosphor plate is positioned with its long axis laterally. The central ray (PID) is aimed with a vertical angle of +65 to +70 degrees, a horizontal angle of 0 degrees and centered on the bridge of the nose. 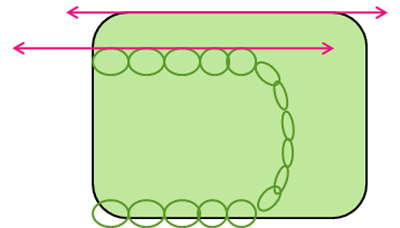 Long-axis of film placed horizontally. PID positioned (centered on bridge of nose) with a vertical angle of +65 to +70 degrees and a horizontal angle of 0 degrees. 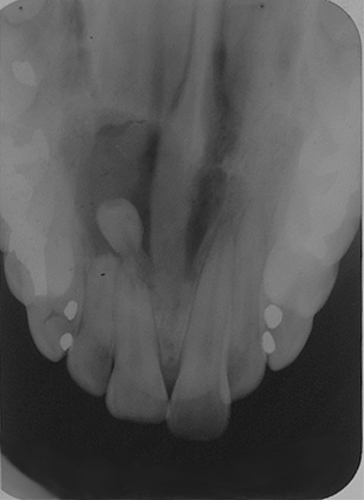 Example maxillary standard occlusal radiograph. The maxillary lateral occlusal radiograph is made using a size 4 film/phosphor plate with the long axis parallel to the facial surfaces of the posterior teeth. The central ray (PID) is aimed with a vertical angle of +60 to +70 degrees and centered slightly inferior to the corner of the eye. Diagram showing long-axis of film parallel with facial surfaces of posterior teeth (pink arrows). 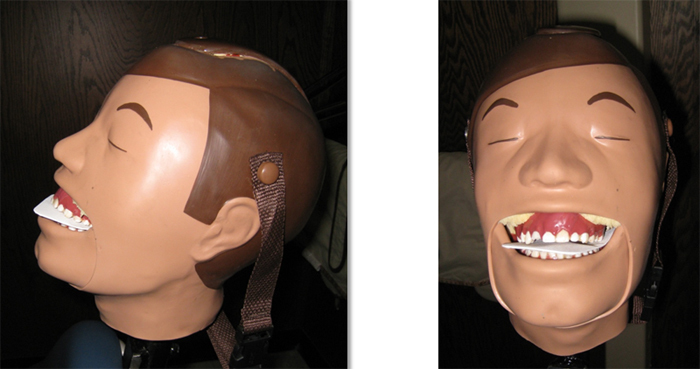 Long-axis of film parallel with facial surfaces of posterior teeth. PID positioned (centered on just inferior to the corner of eye) with a vertical angle of +60 to +70 degrees and a horizontal angle of ~90 degrees. Example maxillary lateral occlusal radiograph.